Pump House Gallery presents an exhibition expanding on The Committee, a 2013 project presented at Frieze London Art Fair by artist Pilvi Takala. In this project, Takala invited a group of children who were regulars at a London youth centre to spend £7,000 prize money that she had been awarded in any way they wished. Free to choose how they would spend this money, the children decided to design and produce a custom-made bouncy castle called “Five Star Bouncy House”, which could be used by them and hired out to raise funds for the youth centre. As part of the project Takala produced a video where the children explain the process of how they decided to spend the prize money- discussing the process of decision-making and the values that guided them. For the project at Pump House Gallery, Takala returns more than three years later to interview the children- since then the youth centre has been forced to close due to funding cuts. In her complex and rich practice Takala confuses the space of exactly what the work is, whether a performance, a video, a sculpture or the space left behind after one of her interactions. Takala’s work sits between a serious investigation and playful agitation of social and political structures. Using disguise to engage and negotiate different social terrains, she reveals unspoken rules within systems of culture. 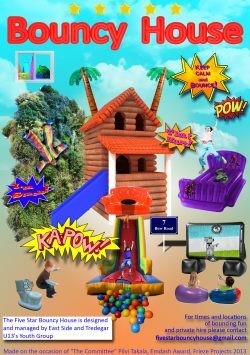 As part of the exhibition the “Five Star Bouncy House” will be erected on weekends when the weather permits. In our Project Space there will also be a drop in participatory activity designed by the artist Emma McGarry. For more information please see the gallery website . The Committee (2013), was a project produced for the Emdash Award as part of Frieze London Art Fair. Takala (b. 1981) lives and works in Berlin. 2016 solo exhibitions include: Pilvi Takala, Kunsthal Aarhus, Denmark; Pilvi Takala, CCA Glasgow, Scotland. 2016 groups exhibitions include: Manifesta 11, Zurich; Bucharest Biennial 7; Detail ist alles, Kunstahlle Mainz. Pump House Gallery is a public contemporary exhibition space housed in a distinctive four story Grade ll* listed Victorian tower by the lake in Battersea Park. The pump house tower was built in 1861 to contain a coal-fired steam engine house, water pump and cast iron tank to feed water from the Thames to an artificial rock cascade in the nearby lake and water plants in the Park. After a fire in the 1950’s, which destroyed the windows and the original roof, the building fell into disrepair and eventually became derelict. After renovation the building opened as an interpretation centre in 1988 and following further development became Pump House Gallery in 1999, presenting a year round programme of contemporary visual art. Collaboration and participation are at the heart of its programme.